I am excited to have Amanda Morgan of Not Just Cute, sharing a few perspectives and tools with us today. Amanda is a blogger, mom, educator, and author of several e-books, including (affiliate) Parenting with Positive Guidance. Welcome Amanda! As parents, we all want what's best for our children. Desperately. We're on a constant quest to find the best approach, the ideal experiences, and the perfect things to say. But the truth of the matter is, life just isn't perfect. And, incidentally, neither are we. There is certainly no ONE right way to parent, as the shelves full of parenting books in every book store and library will attest. If there was one right way, we’d all own that book and have it memorized. Instead we find that there are millions of parents with just about as many approaches for meeting the needs of their children. 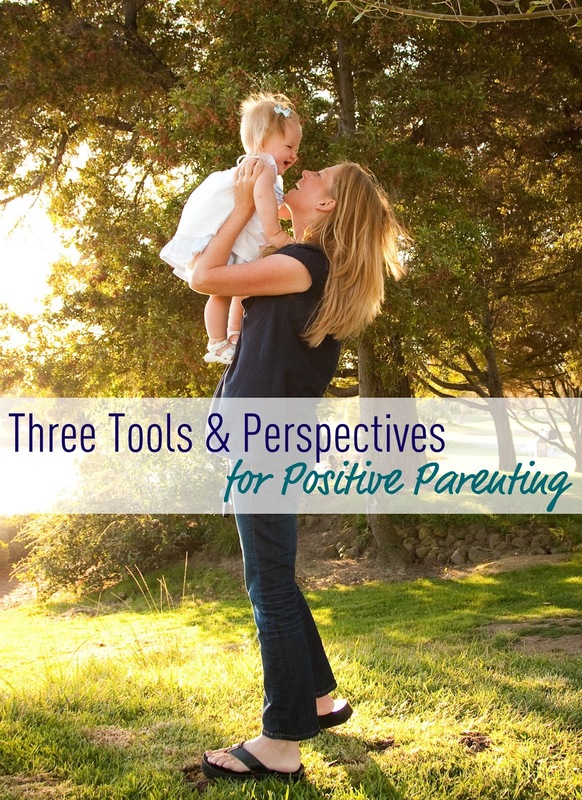 Here are three of my favorite tools and perspectives for positive parenting. 1. Patience isn't something you're born with. Few endeavors require as much patience as parenting does. And somehow, it always seems to be in short supply. I often hear people wishing they had more patience as though they were wishing for more hair or longer legs. As though it was something they were born with. But here's the secret: Patience isn't an innate personality trait. It can be developed. First, it's a function of understanding and having appropriate expectations. If you expect your two year-old to sit quietly for an hour as you read Shakespeare's sonnets, you'll be disappointed and frustrated every time. Have appropriate expectations and you'll find your child suddenly seems more compliant, largely because you've made it possible for him/her to succeed. Secondly, it's important to realize that if patience comes from within us, we can't expect to find it when we're running on empty. Just as the airlines remind us that in the case of an emergency, we need to secure our own oxygen masks first, so it is with patience: we can't give what we don't have for ourselves. Taking care of ourselves -- getting enough sleep, healthy food, exercise, and time for peaceful reflection -- fills our own reservoirs so that it's possible for us to find the patience we need. 2. Connection enhances correction. Think of the last time a stranger gave you some advice. (If this hasn't happened to you yet, just imagine.) Did they tap you on the shoulder in line at McDonald's to let you know you should have ordered a number 4 instead of a number 6? Did they point out that your hair could use some highlights? Did they suggest you switch your favorite soda....or give it up all together? Did you step right up and follow the suggestion, or did you walk away thinking, "Random. Why were you even talking to me about that?" Now think of the last time you got some advice from someone you feel really close to. Did you weigh that advice differently? Even in trivial examples like the ones above, we're more likely to consider the suggestions made by someone we have a relationship with. Someone we love and trust. Likewise, our children are not wired to accept our correction simply because they share some of our DNA. They are, however, inclined to consider what we say when they feel a sense of connection. When they know they are safe, loved, and understood, their attention focuses, and their motivation increases. 3. Children need a balance of boundaries and choices. An understanding of child development makes it clear that seemingly competing forces are at play during childhood. On the one hand, our children want boundaries. Though they may protest (and you'll see why in the next paragraph), they actually feel a sense of security from consistent and predictable limits. At the same time, children are propelled by a desire for independence, power, and control. It's a good thing really. It's the driving force behind their rapid skill-building. It's what gives them the tenacity to learn how to put on their own shoes, ride a bike, and --one day-- go out and get a job. Put the two together and it seems you have a walking contradiction. Do we let them choose, or do we exert our parental authority? Parents often feel trapped in a no-win battle. That is, until they recognize the pattern and use it to their advantage. By stating clear boundaries and offering acceptable choices within them, children feel the security of boundaries as well as the satisfaction of autonomy. Battles decrease, expectations become clear, and a positive script is established. It's one of my favorite tools, and can be used in so many different situations. These are just a few of the principles and tools I share in my Parenting with Positive Guidance Ecourse. As I mentioned before, there's no ONE right way to parent. There are too many variables. Different personalities, different family dynamics, different challenges. But with a variety of tools in our toolbox, and an understanding of how they to appropriately use them, we're better prepared as parents to effectively face the many challenges we face as we work to give our children the very best we can. Have you registered for Amanda's Parenting with Positive Guidance Ecourse yet? You just have a few more days, so head on over now and sign up! I guarantee you will love it! Disclaimer: I am part of the Parenting with Positive Guidance e-course affiliate program and will receive a commission on your e-course tuition should you choose to sign up (which I hope you do, because the course is awesome! ).